Spent time on the Yuba River in Northern California last week. 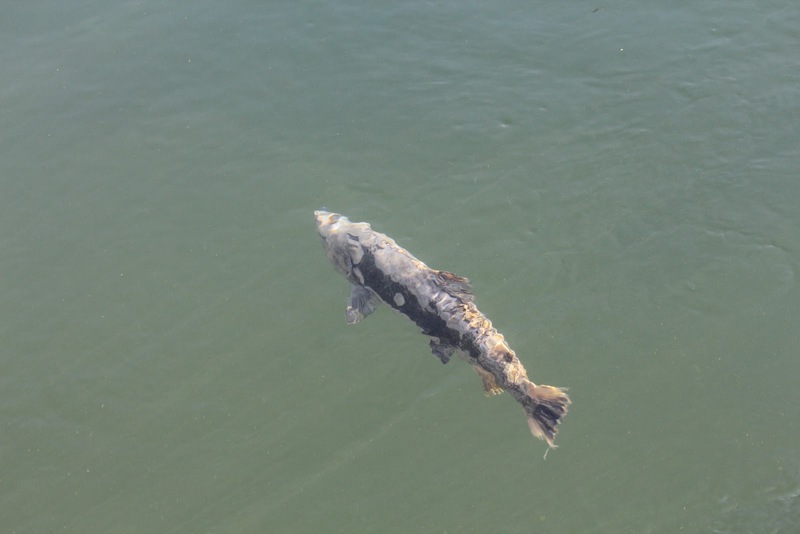 Here are a few shots of the fall salmon run at Daguerre Point Dam. 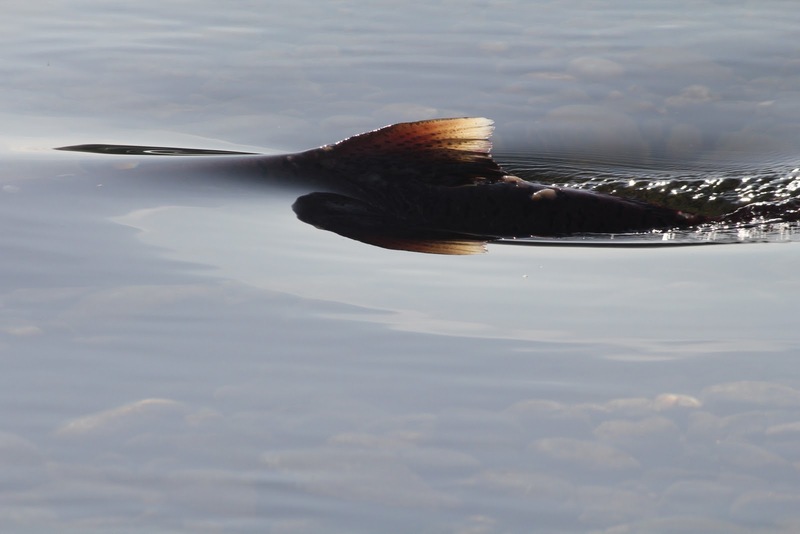 The fall run looks strong, the spawning activity amazing—languid mating in the sun, the female finning aside gravel to make a welcoming nest for her eggs, the male pacing in the shallows nearby before gliding in to cover the nest and fertilize the eggs. Very romantic in its gentle, deliberate pace. Nature at its most romantic. Saw some 35-40 lb. salmon that made it up the fish ladder. Swear it! But so skinned and battered by the 150-mile swim from the Pacific Ocean they didn’t look like the pink and silver speckled specimens we’d call salmon. They looked more like koi. Not good eating at this point in the life-cycle. 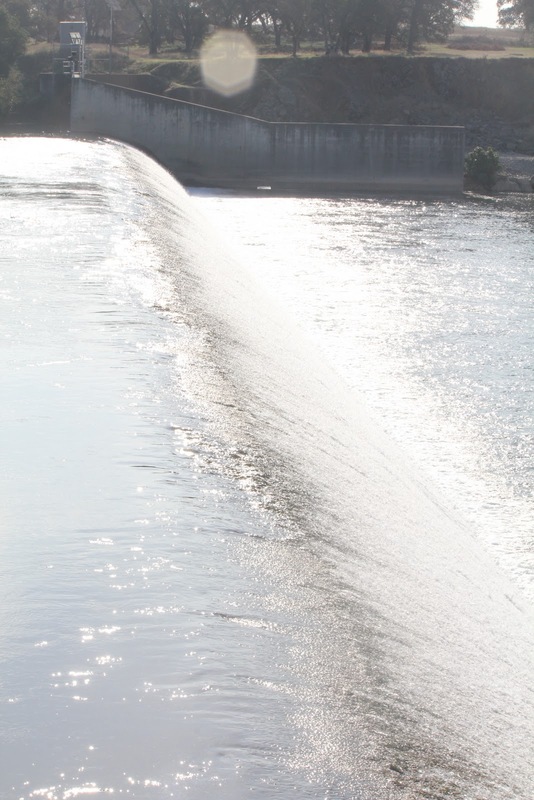 But, it’s thrilling to see this annual spectacle, the fish jumping and schooling behind the dam, thousands preparing for the next leg of the primeval journey further up river. Runs in recent years have been on the small side so I was very excited to see the strength of this year’s run, to see fish that have been out in the ocean for several years finding their way back home. The fish ladder beside the dam seems to be working very well, covered now with grates, a gradual stair-step beside Daguerre Point Dam that eases passage for the fish heading both away or to the Pacific Ocean. 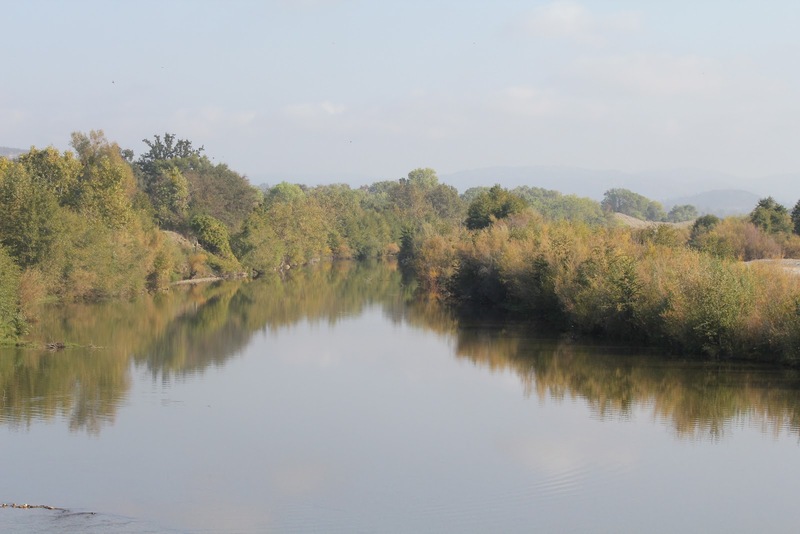 It was a beautiful fall day on the river, driving around with Yuba County rice grower Charlie Mathews, who is a prince, and his beautiful Chessie – Maggie. Dog knows how to hit the right button on the pickup truck’s door to lower the window and jump out to follow Charlie or chase ducks! Salmon are born in the rivers along the West Coast and swim to the ocean where they live in saltwater– sometimes for a year, but often longer. At spawning time, they return to the river where they were born, lay the eggs, and then die. The young hatch and start the life cycle over again. Salmon have always been an important mainstay food source for the Northwest Native American people, as well as for wildlife, including many bald eagles, bears, and river otters. 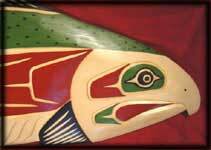 This is the reason salmon is a popular subject in Northwest Native Indian artwork and culture in the form of Northwest Coast Native American stories. In the beginning, the Creator taught the people how to care for this food, which was created especially for them. He said, “Do not neglect this food. Be careful that you do not break the rules in taking care of this salmon. Do not take more than you need.” He told them if they observed these rules, the salmon would multiply many times over as long as they lived, as long as their children lived. At first the people diligently obeyed the rules, but then became careless and neglected the instructions. They became greedy and did not take care of the salmon. Suddenly the salmon disappeared. When the salmon were no longer coming up the stream for the people to catch, everybody frantically searched the rivers, but all in vain. There was not one salmon left to be found. Soon they became hungry. Somebody said, “let’s ask Grandfather to help us! He is a powerful man. Let him revive the salmon!” A messenger was sent. The messenger was sad. “You are our last hope. Please help us, Grandfather.” Finally Old Man Rattlesnake agreed. “I will do my best.” But, he was so old it was very painful for him to move fast. He moved ever so slowly and it seemed like such a long way for one so old. Finally, Old Man Rattlesnake arrived at the river. Painfully he crawled over the salmon four times. The fifth time something magical happened! Grandfather disappeared into the salmon and the salmon woke up and came back to life and the salmon came back to the rivers. The people learned their lesson well and took care to protect their salmon from then on. Today when you catch a salmon, and you are preparing it for eating or preserving, if you break the spine you will find a white membrane inside. That is old Man Rattlesnake who gave life back to the salmon. Happy Fall Run! If you can, get to the rivers, greet the fish, learn the lessons, and bask in the sun before the cold clamp of winter grips us. When you get back, I’ll see you in the garden!